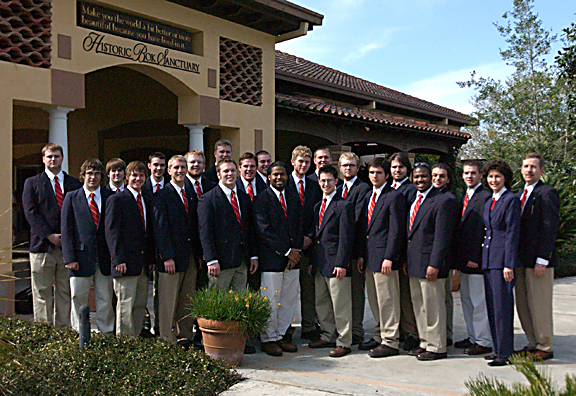 The Wabash Glee Club, under the direction of Richard Bowen, began their spring break tour of Florida in outstanding fashion. Former Wabash president Thad Seymour H’78, his wife Polly, and John Heiland ’41 hosted the Glee Club at Winter Park Towers. John welcomed the group to Florida and turned the microphone over to President Seymour who provided a brief history of the Glee Club’s spring break tours. With a crowd well over 100, the performance delighted everyone! From a rousing start with "Old Wabash" to some classic Glee Club numbers, Richard Bowen had the group at the top of their game. Special performances included the "T-Tones" and a stirring Gospel number by seniors Greg Priester and Howard Bailey. The crowd was treated to a fun and entertaining evening. After the performance, the Seymours and Heiland hosted a reception for the Glee Club and attendees. Many thanks to Thad, Polly, and John for their hospitality.